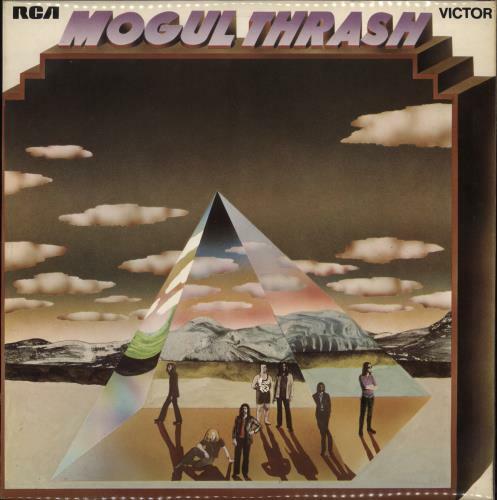 MOGUL THRASH Mogul Thrash (Rare 1971 UK first issue 6-track LP, the only album release from the progressive rock band featuring James Litherland [Colosseum], John Wetton [King Crimson] & produced by Brian Auger, front laminated picture sleeve. The sleeve has only a few light signs of age with just a few creases to the laminate on the edges, the vinyl shows some signs of having been played, but there is very little lessening in sound quality despite a few noticeable surface hairline marks. A very respectable copy of this over forty year old pressing SF8156). Related Artists: 21st Century Schizoid Band, Adrian Belew, Boz Burrell, CJ3: Crimson Jazz Trio, David Cross, Eddie Jobson, Freeway, Giles, Giles & Fripp, Gordon Haskell, Ian McDonald, Ian Wallace (Crim), Jack-Knife, John Wetton, King Crimson, McDonald & Giles, Michael Giles, Pete Sinfield, Qango, Robert Fripp, Robert Fripp & Brian Eno, Ten Seconds, The California Guitar Trio, Toyah & Fripp, Trey Gunn, U.K.